One week after the deployment of the Marine Corps’ new crisis-response force for Africa began, additional details about it are starting to surface. 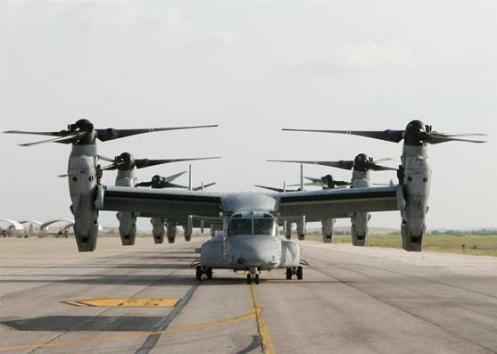 The six MV-22B Ospreys supporting the unit are from Medium Tiltrotor Squadron 365, out of Marine Corps Air Station New River, N.C., according to a Marine Corps news release published today. Elements of the unit, commanded by Lt. Col. Christian Harshberger, arrived at Morón Air Base, Spain, on Saturday after making a 15-hours transcontinental flight from the U.S. They arrived with two KC-130J tanker planes that will support the unit during the deployment. Commandant Gen. Jim Amos told Congress last week that the Ospreys flew to Maine first and were staged there before making the flight across the pond. The Corps has not yet announced which other units have deployed as part of the force. It will be based around a reinforced infantry company out of Camp Lejeune, N.C., and include more than 500 Marines, Amos said. The commandant told Congress that the new unit can train friendly foreign militaries, but its main function is to respond quickly in a time of crisis. The unit was conceived to cope with the kind of turmoil that has arisen during the past year in Mali, Algeria, Libya and other north African countries. Most famously, the U.S. diplomatic facility in Benghazi, Libya, was attacked in September by a heavily armed group, who killed U.S. Ambassador J. Christopher Stevens and three other people. Amos told me last week that the crisis-response force will be commanded by a colonel, who will have staff in Morón. It will likely deploy for about a year at a time for continuity’s sake, while the rank-and-file forces in the task force will rotate every six months. None of the tours will be accompanied, meaning Marines will not have their families join them in Spain.